NC State's thermoelectric harvester has the material quality of rigid devices inside a flexible package. Credit: Mehmet Ozturk, NC State University. In a proof-of-concept study, North Carolina State University engineers have designed a flexible thermoelectric energy harvester that has the potential to rival the effectiveness of existing power wearable electronic devices using body heat as the only source of energy. Wearable devices used to monitor a variety of health and environmental measures are becoming increasingly popular. The performance and efficiency of flexible devices, however, pale in comparison to rigid devices, which have been superior in their ability to convert body heat into usable energy. "We wanted to design a flexible thermoelectric harvester that does not compromise on the material quality of rigid devices yet provides similar or better efficiency," said Mehmet Ozturk, a professor of electrical and computer engineering at NC State and corresponding author of a paper describing the work. "Using rigid devices is not the best option when you consider a number of different factors." Ozturk mentioned superior contact resistance - or skin contact - with flexible devices, as well as the ergonomic and comfort considerations to the device wearer. 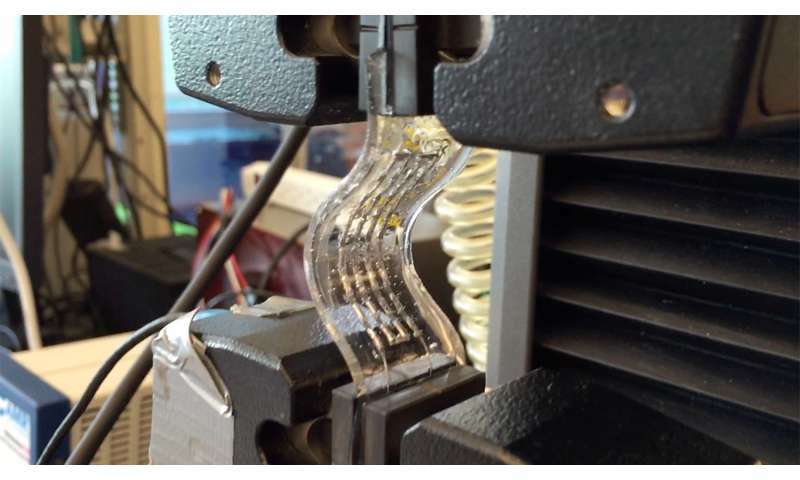 Ozturk said that he and colleagues Michael Dickey and Daryoosh Vashaee wanted to utilize the best thermoelectric materials used in rigid devices in a flexible package, so that manufacturers wouldn't need to develop new materials when creating flexible devices. Liquid metal in the flexible thermoelectric device allows for self-healing. Rigid devices do not have the ability to heal themselves. Credit: Mehmet Ozturk, NC State University. Ozturk said one of the key challenges of a flexible harvester is to connect thermoelectric elements in series using reliable, low-resistivity interconnects. "We use a liquid metal of gallium and indium - a common, non-toxic alloy called EGaIn - to connect the thermoelectric 'legs,'" Ozturk said. "The electric resistance of these connections is very low, which is critical since the generated power is inversely proportional to the resistance: Low resistance means more power. "Using liquid metal also adds a self-healing function: If a connection is broken, the liquid metal will reconnect to make the device work efficiently again. Rigid devices are not able to heal themselves," Ozturk added. 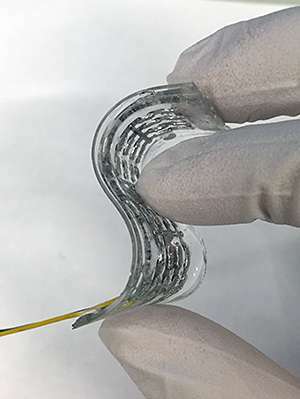 Ozturk said future work will focus on improving the efficiencies of these flexible devices, by using materials and techniques to further eliminate parasitic resistances. Dickey, Vashaee, Francisco Suarez, Dishit P. Parekh and Collin Ladd co-authored the paper, which appears in Applied Energy. The group also has a pending patent application on the technology.